To check which ward a property falls into, the postcode can be entered at https://mapit.mysociety.org/ and it will tell you immediately. New Thermostatic Radiator Valves (if not present or not functioning efficiently). No means testing. Completely free of charge. New HMO licencing – 5 persons or more sharing – New legislation begins on 1st October 2018. Only 5 days to go to get your applications in to the local authority where an early bird discount may be applicable. Vice Chairman, Iain Maitland attended the launch of the Property Agent Rating Scheme for Teignbridge on Wednesday 19th September 2018. 19 agents were awarded ratings from bronze to platinum. Price – £65 for members of SWLA, £75 for non – members for one day course. Course covers ASTs, Deposits, Section 21s, Section 8s, HMOs, Gas and Electrical Safety, Inventories and much more. The course will provide you with all the skills to start, manage and finish a tenancy. Places still available. Contact the office on 01752 510913 or via the website to book your place, places secured on receipt of payment. Over 700 landlords have already completed this course since September 2011. Course can lead to Accreditation, if required. We are proud to announce Landlord Accreditation South West (LASW) are founder members of the West of England Rental Standard. If you are accredited this will count towards your CPD hours, but the course is open to all. Cost for SWLA members – £65. Cost for non-SWLA members – £75. Places secured upon receipt of payment, book your place through the office 01752 510913. From 1st October 2018, TradePoint members are eligible to receive flat rate discounts when they spend and swipe their TradePoint membership card. The discount is applicable on practically every product across B&Q and TradePoint. Spend £250 in a month and you’ll receive 5% discount off your products until the end of the following month. Spend £1,000 in a month and you’ll receive 10% discount off your products until the end of the following month. These changes will help make B&Q low prices even lower for loyal members. When you spend £250 or £1,000 in any given month (including refunds or cancellations) B&Q trigger your discount. Your discount will be valid until the end of the following month. B&Q will apply your correct level of discount within 7 days of you reaching the qualifying spend. 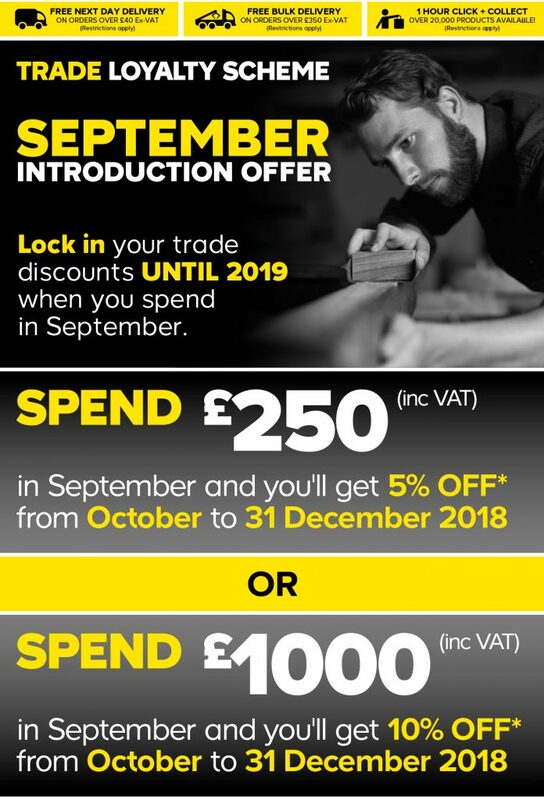 If you let B&Q have your email address they will send you an email advising you that your discount has been applied and a monthly spend update. Each calendar month is a qualifying period – so there’s a chance to earn the discount every month. On Wednesday 5th September, SWLA Office Manager Gillian Kerr attended The West of England Landlord Panel in Bristol. Main subjects covered were HMO licencing and Universal Credit. Linda Johns (SWLA Committee Member – Policy and Liaison Officer) along with SWLA Vice Chair Iain Maitland attended Plymouth City Council’s Charter Steering Group. They met Plymouth’s new Portfolio Holder- Cabinet Member for Housing; Councillor Penberthy. Discussions were held regarding private rented accommodation within Plymouth and Pledge 33 from the Labour Manifesto. Other items included the plan for preventing homelessness.